I've been having a lot of fun with my HP Prime, but one noticeably missing feature is a 3D parametric graphing app. 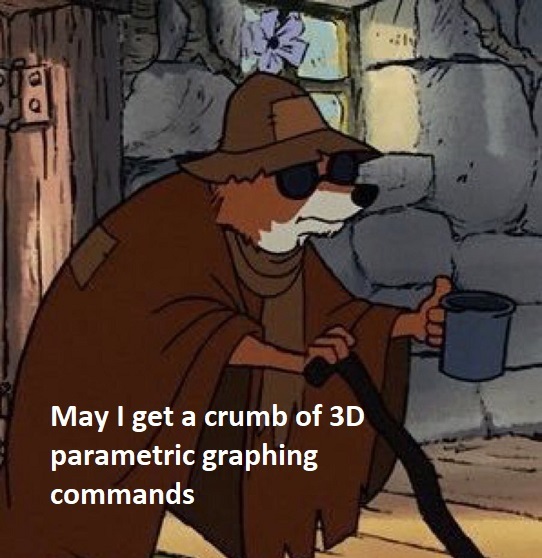 There's a 3D grapher but it only accepts equations in the Z= format. I was wondering, what math goes into making a 3D parametric grapher? The Prime is definitely powerful enough to run such a program, but is it a good project for someone learning a new language? Very nice! The fact that the HP has commands that let you draw solids in 3D, and will then rotate them for you, is just complete magic that I wish us poor TI coders had. © Copyright 2000-2019 Cemetech & Christopher Mitchell :: Page Execution Time: 0.133487 seconds.